Locally controlled, this radio family continues to grow, by focusing on the process rather than the product. Learn how clever thinking in a time of change has led to success. Turns out you can go home again, despite playwright Tom Wolfe’s claim. For proof, just look to Mid-West Family Broadcasting and Mike Paterson. 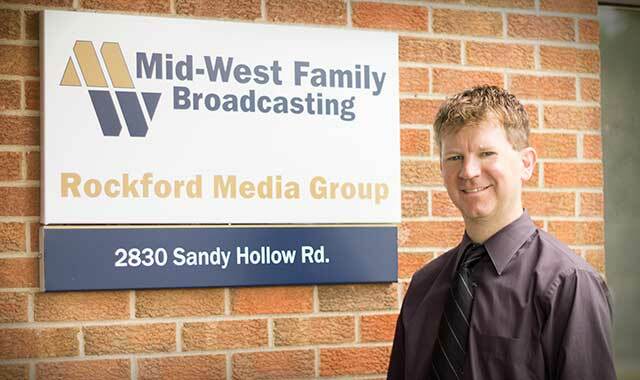 The Freeport native, who has held management positions in major radio markets in Wisconsin, Texas, Georgia, Minnesota and Missouri, returned to the area in July 2013 to take on the duties of general manager at Mid-West Family Broadcasting in Rockford. Mid-West’s purchase of Maverick Media, back in April 2013, was also a kind of homecoming for the Madison-based, family-run company, which has owned stations in Rockford twice before, dating back to the 1950s. “This building is the original Mid-West Family Broadcasting, when WKMQ bought it, and they always wanted to come back,” says Paterson. He, on the other hand, wasn’t even thinking about a move. As general sales manager at KSHE in St. Louis, the 42-year-old Freeport High and Univeristy of Wisconsin-Madison grad was content. After having relocated from Atlanta to Minneapolis-St. Paul in 2009, and from there to St. Louis in 2011, he had no plans to move his family again anytime soon. Then he got a call. “The people in Madison, who first hired me back in 1993, were letting me know about Mid-West Family Broadcasting getting Maverick, and said I should apply for general manager,” Paterson says. As a communications and journalism major at UW, Paterson’s first job in radio was at Z104, at the time, a Top 40 station in Madison. Even then, he was aware that the employee-owned Mid-West Family Broadcasting was among the top companies in the region. Mid-West also actively supports the communities in which its employees, advertisers and listeners live and work, by investing in local events and charities. For example, B103 is sponsor of the “Making Strides Against Breast Cancer” walk in October. Mid-West Rockford took part in National Night Out; is a large donor to Rockford’s fireworks; and is active with the Rockford Chamber of Commerce and Rockford Area Economic Development Council. The company’s philosophy, “Mid-West Family Broadcasting is not product driven; we are people driven,” mirrors Paterson’s leadership style. The wall next to his desk is plastered with inspirational sayings, and he points to one: “You don’t build a business – you build people – and then people build the business,” from motivational guru Zig Ziglar. Paterson offers some eye-opening statistics. “Radio reaches 90 to 95 percent of our market, and it’s always been free,” he says. “Satellite has about 25 million listeners, which sounds like a lot, but there are about 350 million people in the U.S., which comes out to 7 percent of the total audience. Then, when you figure that there are 300 satellite stations to choose from, one station may have just 15 listeners in Rockford. Mid-West reaches 45 to 50,000. He points to radio commercials by local appliance dealer Al Grace as examples of good ads. No matter how clever, the message must be tailored to the particular needs of that advertiser at that particular time. Mid-West has five radio stations in the Rockford market: 104.9 The X rock, B103 adult variety pop hits, 95.3 The Bull 20-in-a-row country, The Mighty 100.5 Rockford’s greatest hits, and La Movida 1330 Spanish hits. “Each station is carefully designed to appeal to the unique aspects of its audience,” Paterson says. “We offer unique digital and interactive optimizations for web advertising, and high visibility through the events we produce. Our advertisers can reach people with our full integrated media and marketing. Much has changed since Mid-West came back to Rockford – format shifts, personnel turnover – and Paterson knows it’s been tough on employees. If home really is where the heart is, then Paterson and Mid-West Family Broadcasting are at home in Rockford. This entry was posted on Thursday, August 14th, 2014 at 11:59 am	and is filed under Northwest Business Magazine. You can follow any responses to this entry through the RSS 2.0 feed. Both comments and pings are currently closed.